Since writing this, I have found a "solution" to the problem. "Solution" in quotes because it is merely a work-around and doesn't actually solve the underlying problem. All I did was install firefox, set it as the default browser and start over with the procedure described below. Here's one that has me stumped. Rest assured, if I do get an answer to this problem I'll publish it here so that other people coming up against the same problem can find help. 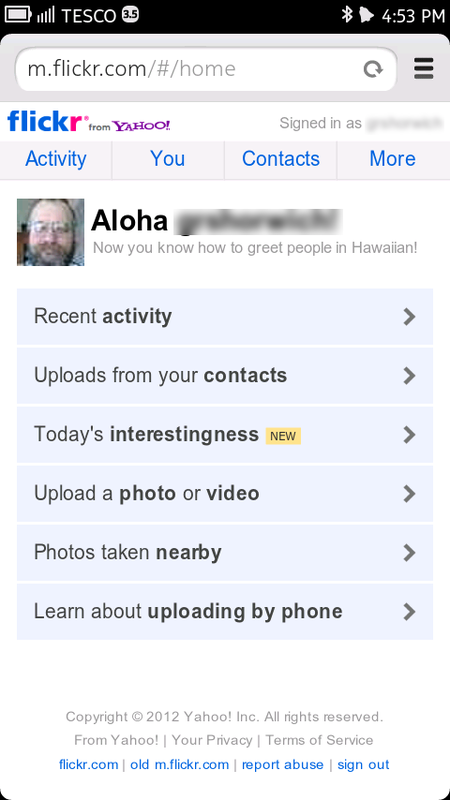 The nature of the problem is quite simple: it is seemingly impossible to set up my flickr account on this phone. 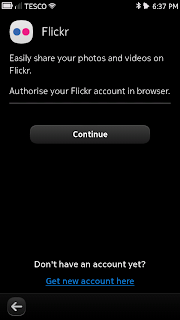 Flickr apparently uses an oAuth system similar to that of twitter, whereby the client application (the built-in flickr client in the N9 in this case) contacts the flickr API saying "I want permission to access your services". 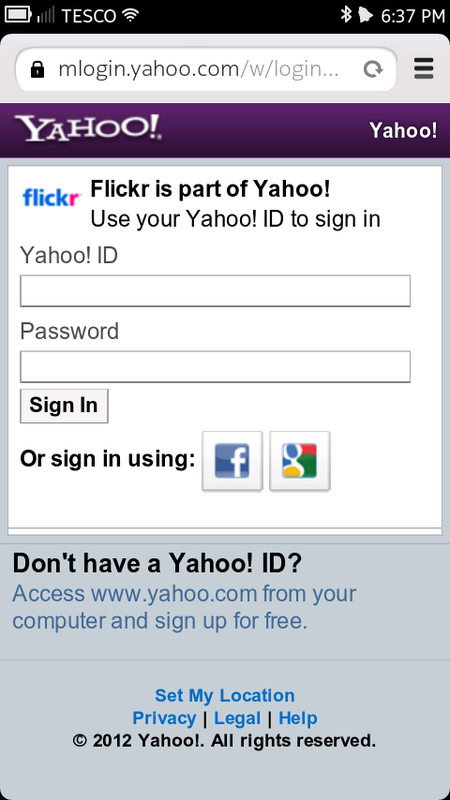 The flickr API then prompts the user (me) to log in and grant the client this permission, in response to which, the API returns a token to the client. 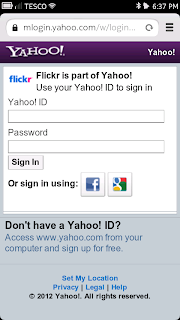 In order to access flickr's services thereafter, the client has to present that token as proof that the user gave it permission to access their account. If anyone has some ideas, I'm all ears! My phone is a Nokia N9 running PR1.2. Hi! I have the same problem in my n9... how did you set Firefox as default browser? 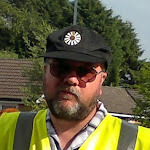 Thanks for the work-around! It seems that is not possible in PR1.1 (my carrier hasn't released the update yet). Anyway, I just copied the authorization url (before the browser redirects me to flickr home) and pasted it in Firefox... Now, my account is authorized! 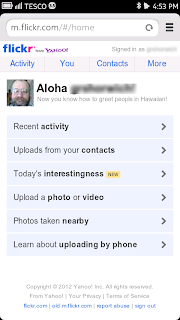 I worked around this by editing the Flickr authentication URL. I downloaded the QuickFlickr application from OVI store. It has a similar authentication scheme with the difference that it works. 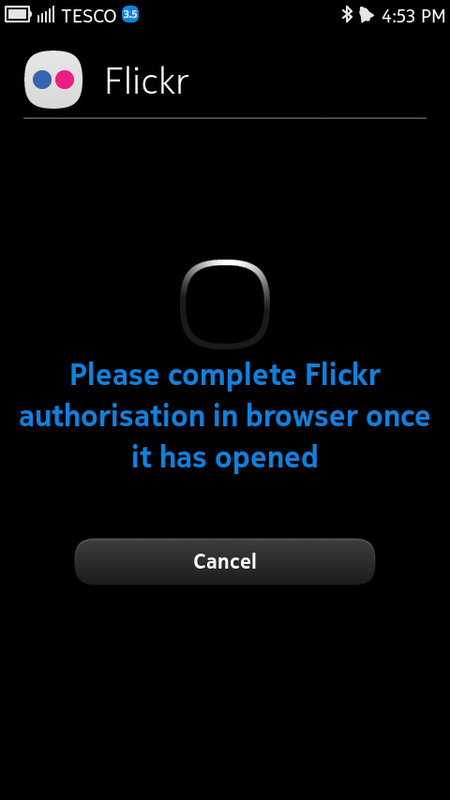 First of all I was already logged in to Flickr with the N9 Nokia browser. After using QuickFlickr and comparing the URL:s I started the Flickr account authentication process, immediately pressed stop in the browser so that Flickr cannot redirect me, and edited the URL. I think I removed "fresh" from the end of the URL, before the parameters. 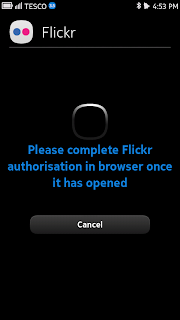 After editing I just used the edited URL and Flickr allowed me to complete the authorization process. 1. Start the account auth process normally. Complete it. This fails, as you noted. 2. From the opening m.flickr.-com page scroll to the bottom and choose the 'regular flickr.com' page (full desktop page). 3. 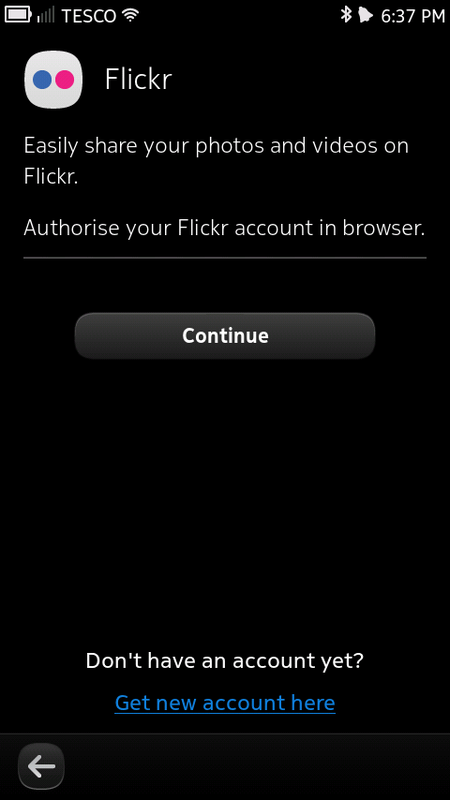 Return to the accounts app, press cancel and do the 'add flickr' process again. It should now work. Interesting. I did actually try that at the time and it didn't work then. Maybe something has changed meanwhile.